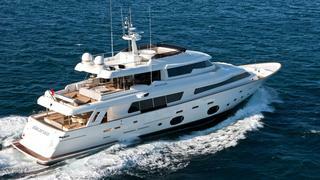 The 32.62 metre Custom Line Navetta Crescendo motor yacht Ziacanaia, listed for sale jointly with Bart de Ven and Mika Papunen at KK Superyachts, has been sold with Boatwish International introducing the buyer. This GRP yacht was originally built by Ferretti Custom Line for Norbeto Ferretti, the co-founder of the Italian superyacht builder, and launched in 2011. Ziacanaia, described by her broker Bart de Ven as “an exceptional motor yacht”, is the very embodiment of the Custom Line ethos. Mr De Ven added that her custom Fendi Casa interior “is the best that we have ever seen on a yacht this size”. Her accommodation includes a spacious saloon with huge windows, sliding doors opening to the aft deck, plus sliding doors opening to the starboard balcony. Along the corridor forward is the galley on the portside, and day head on starboard. The huge master cabin with bathroom en-suite is located on the main deck. On the lower deck there are three guest cabins, all with en-suite bathrooms, plus the standout features of a gym and Turkish steam bath. The upper deck contains the pilothouse and sky lounge, which can be open or closed, allowing for great views. The flybridge has a Jacuzzi, shower and sun lounging areas. The aft deck at the main deck level has a sun lounging area that can be used in conjunction with the swim platform area while at anchor. There is also a sun lounging area on the foredeck. Power comes from a pair of 1,360hp MAN shaft drive diesel engines, which allow for a cruising speed of 15 knots, topping out at 17 knots. Ziacanaia was asking €5,950,000 with VAT paid.